I was transported back to our street and to your house and ours. Such wonderful reading on home like mine though my red is Fragrant Cloud and Camp David. I am so glad to be reading your writing again, Take Care and Good Luck Ailsa Piper. To take the everyday and fill it with poetic resonances as you have done with your reflection on HOME is the mark of sensitivity and a caring heart. My wife and I have just been away for a month – a lovely time albeit with some grief -in NYC – she fell (on the Highline, of all places) and last week with our return discovered her discomfort was from three cracked ribs! I became ill – a kind of me-too-ism! After a week in Waikiki (first time ever to Hawai’i) how good it was to be HOME. The familiar – the warm – everything in its place and everything known! My illness though forced me two days later into hospital for five/six days. 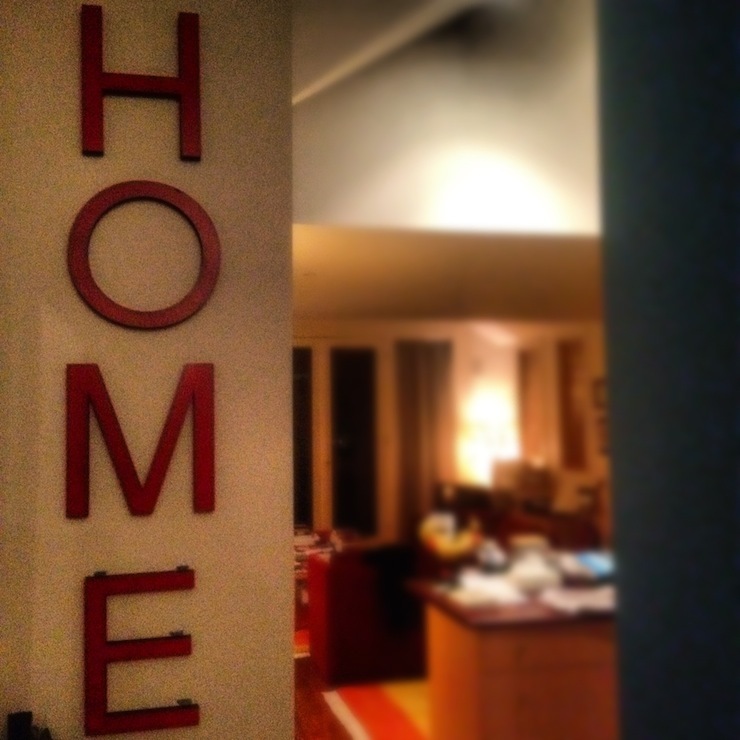 I am just HOME. I think everyone who has ever spent time in hospital knows where they would rather be! Though I must say that all the teams: nursing; surgical, other consulting – were first-rate (even the food in part, too) doing their best to make me and my fellow patients feel at HOME! But that’s impossible, of course – even as I award full-marks for best effort! Thanks for your writing! As always! I was looking at my blog and doing some maintenance there and reread the review of SAS. It made me think of you and your expressiveness about home in SAS. Made me smile. This post made me smile again today so thank you. I hope you are alright, you know inside where it counts. Your post provoked me to think about things and poems. I wrote a speech for my wife to read at our son’s wedding. I wanted to include a poem and I looked and looked. Eventually I found one by Leonard Cohen which I signalled in the speech. The room tensed a bit at the thought of a Cohen Poem at a wedding, that is until Leanne read it out to them. Relationships that a consummated by weddings come with expectations about forever and persistence and durability and love. Of course humans are not all that durable and I sense some acknowledgement and pain at the memory of those who no longer share your home with you within your post. So I hope you have people close to you, viscerally close I mean because it is so easy to live in the abstract world of memory and longing. I hope those posting on FB are near. Cohen is a dangerous poet, as as write this to you I wander at the wisdom… but then I think that we are all adults and we know what is right. This is a nice poem for the beginning and something to reflect on later. For me this a reminder to continue the path of going “your way”, even when the partner is no longer there to travel with you. Be well Ailsa. You have written a lovely contemplation on home . But it seems sad also. Thank you for such a thoughtful and generous response Harry. The poem is lovely. Sad? Maybe a little. But it’s hard to be sad in the presence of gratitude and I feel so very much of that for my home. And all those who have breathed life into it and us. A timely reminder of to stay in the moment and be grateful for all that home means. I can’t believe you took the time to write. Thank you. I remember you so well – how torn you felt, and how uncertain. Yet you stayed and you prevailed. You will prevail through this next time, and through the following days and weeks. If I can make a suggestion…let people help. When they offer, allow help. You may be good at this already, given how much time you have had with his illness. But if you are not, let people help. They want to, and you will be helping them. It has been a hard lesson for me, and I want you to learn it easily. You are brave and strong, even when you don’t feel it. And whatever we go through, we have loved and been loved and that is the miracle. The cost is high. But we have been loved, and you have children who will love you and be loved by you. Doubly, now. You shine in my memory, and I hope our paths will cross again. I send love and support and strength and comfort. You can get through this. Take one small step at a time. Just one. How wonderful to read your poem of home. It reminded me of my own home in another place and time. Do you remember having me and Jef Riner for dinner one night long ago? I especially remember the studio and the warmth of rugs and guitars in it. I read your blog and so wanted to reach out to you after your loss. Your writing has a palpable essence of sensitivity and humanity which makes for ravenous reading. You are a remarkable writer. I haven’t read Sinning across Spain. Did you walk the Camino? It’s on my list of things to do. Must go for now – but wanted to stop by and tell you that I feel for you and your loss. I hope the world gradually opens up to show you its splendour and warmth and love in the darkest of times. Yes I do remember that night. Glad you do too. So lovely. Yes, I did walk the camino. In fact several camino roads! And yes, that is what the book is about. I’m always amazed when anyone comes to this blog without reading the book – I assume that is the path people take to get here. If you want to know more about the walk, you can click on the ABOUT section. I think that tells you the premise. Meantime, thanks for stopping by, and for your incredibly kind wishes and thoughts – and the comments on the writing. Means a lot, particularly now.